JJ has been doing scouts for a few years now and it’s something he absolutely loves and looks forward to going to each week. Just recently he moved up to Scouts from Cub Scouts. This means they get more responsibility and go on more camps. On the weekend he went on a back to basics camp. We were provided with a list of things to take, and this time we packed it in my old backpack. It was the backpack I bought in 1991 all ready to go travelling with for my first overseas holiday – the obligatory ‘find yourself’ backpacking holiday. 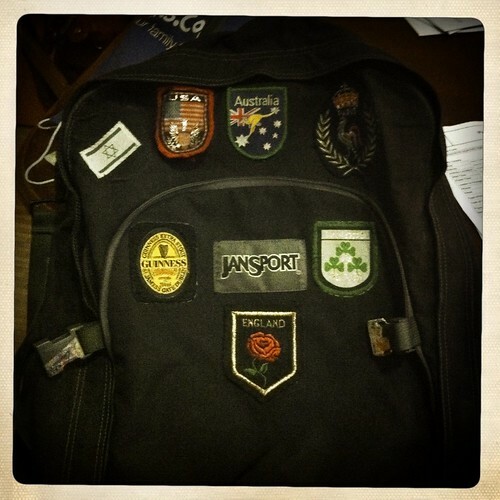 The backpack is a bit battered and worn now and it’s been patched up but I’m glad I’ve kept it because JJ will use it on his next scout camp, the hike. When I dropped him off on Friday one of his fellow scouts commented about the ‘badges’ on the bag, which of course aren’t scout badges. So we got out the items he was told to take and packed it together. I made suggestions of how to pack and for the most part he put things in the backpack. This included spare clothes incase things got a bit wet because they were camping in the Hills and it rained a lot during the week with a good chance of rain again on the weekend. I dropped him off on Friday evening and hoped that they didn’t get rained out. It was after 8pm, and dark, when we dropped him off and they had to put their tents up so they had somewhere to sleep for the night. I was glad it wasn’t me as we went to a nearby pub to sit near the fire while eating a late dinner. I missed him during the weekend but didn’t stress too much about him. Afterall they had my phone number and if needed could ring me. I picked him up yesterday afternoon and when we arrived they were all kicking a ball around on the grass and seemed pretty happy. He was wearing someone’s tracksuit pants that were at least two sizes too small, so they were more three-quarter length pants. He was sockless. He was also wearing a fleecy zip up top of mine so that was a bit like a shift dress on him. The bare parts of his legs that I could see were quite muddy. I knew he’d be absolutely knackered after two nights and days of full-on activities but the first thing he asked me if was one of his mates at the camp could come back to our place. I told him no as it was already mid afternoon and they still had to go back to the scout hall to unpack everything and spread all the tents out to dry. We eventually did all of this and got home. I helped him unpack his backpack. I pulled out clean pairs of jocks and a clean pair of socks – damp. I pulled out a clean pair of jeans – damp. I asked him why he wasn’t wearing those? He told me that he didn’t know they were in there. Remember we packed the backpack together and I explained that he had a spare set of clothes if he needed them. I pulled out all the dirty and damp clothes that weren’t in the plastic bag we’d also packed for all the damp stuff. Next time we’ll put all the clean and dry stuff in a plastic bag and the dirty and damp stuff can be shoved in next to the plastic bag. I put everything in the wash – clean and dirty and he went into the shower to give himself a good clean. We ate dinner at 5pm. I don’t think I’ve ever eaten dinner so early in my life and was happy that I’d organised osso bucco in the slow cooker earlier in the day. I didn’t make him do his night-time jobs like feed the dog or get wood for the fire. I just let him lie flat on the couch in front of the television then sent him off to bed early. He was still tired this morning. But he had a great time on the camp and is looking forward to the next one. I swear that he grows up while he’s away at these camps and he loves earning badges. Speaking of which, I have some sewing to do.